Did Pirates Clean Out Amazon Fire TV Stock in the UK? Most of the UK's biggest retailers are currently running sales but those looking for Amazon's Fire TV Stick will go home disappointed. After massive sales this festive period the product is currently out of stock at all of the largest stores. While Netflix and Amazon Prime are partially to blame, piracy has been a big driver. Amazon’s Fire TV stick is a great little device. Plugging nicely into an available HDMI port on most TVs, the device ‘smartens up’ the dumbest of devices and makes available the growing world of IPTV services. The one currently plugged into my TV in the bedroom has mainly been used for the ‘free’ video streaming services bundled with Amazon Prime but the stick is equally at home streaming video from Netflix or any of the many services available from Amazon’s store. However, Amazon’s little device has a trick up its sleeve. Being Android based, Fire TV Stick can run a much wider array of apps and services than Amazon offers through its regular on-screen interface. Of particular interest is Kodi, which together with a vast array of plugins offers access to all the latest movies, TV shows and live sports most people could ever need. And news of just how special the Fire TV Stick/Kodi combo can be has been traveling fast in the past few weeks, particularly in the UK. The first signs that something might be going on came very early December when even for Prime customers Amazon started advising that delivery for Fire TV Sticks was not the usual ‘next day’, but was actually nearer two weeks. For someone looking to buy two units as gifts, that was unacceptable. Other stores weren’t much help either. Of course, I know about Kodi. We all know about Kodi. But for it to be mentioned without any prompting at the point of sale in a retailer was quite a surprise to say the least. And for a worker at a non-specialist retailer to know so much about it hints at the scale of the issue. In case you missed it, Amazon banned Kodi from its store in the summer over piracy concerns but with the official APK plus adbFire and a loader like FireStarter, the software runs like a dream on Amazon Fire TV Stick. “Everybody is buying these for Kodi, you can get everything on it. But that’s it now, we’re out of stock,” I was told while handing over the cash. Interesting…..
Intrigued, in the weeks that followed I monitored stock at Argos, Currys/PC World, Amazon themselves and several other big retailers including John Lewis and the nation’s biggest supermarket, Tesco. After an initial delay Amazon appeared to do the best in having stock available but all the rest really struggled. Now, just days after Christmas, Currys/PC World have zero stock for home delivery and its the same situation at Tesco, John Lewis and Argos. 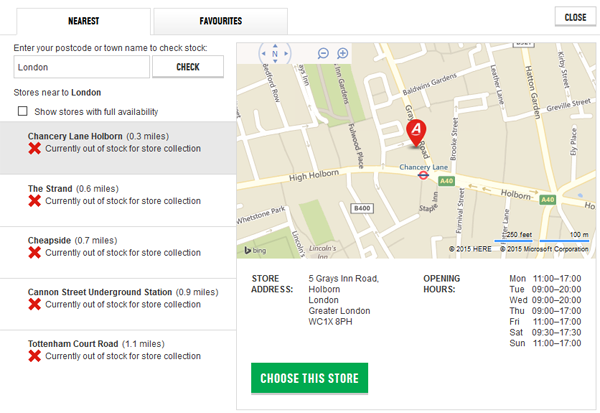 Checking for local stock at the latter in the London, Birmingham, Manchester and Glasgow regions reveals not a single unit available. Only Amazon themselves can offer anything (correct, 28 Dec). Granted, it’s more than likely that Fire TV Stick has proven popular with consumers due to it working with Netflix and iPlayer, but Chromecast does that too and anyone can buy one of those devices at any of the above retailers anywhere in the next hour. Admittedly, it’s a possibility that Amazon screwed up and didn’t make enough Fire TV Sticks. 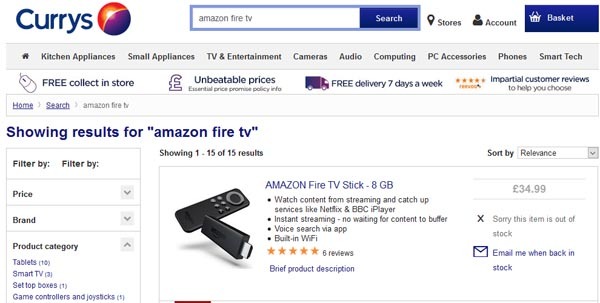 But if that’s the case, why is eBay awash with (ahem) ‘fully loaded’ Amazon Fire TV Sticks for immediate delivery? Also, Google Trends can sometimes offer an insight into what people are interested in during a given period. 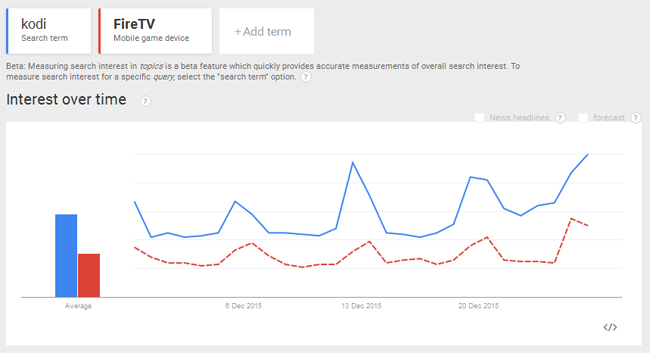 So, we locked into December, did searches for both Kodi and Fire TV, and restricted results to the UK. As can be seen from the image below, not only is Kodi even more popular than Amazon’s device, but the interest in both the software and the hardware follows similar waves. There can be little doubt that interest in both Kodi and Fire TV are now at a high, not only in the UK, but also elsewhere. It’s also a further sign that piracy has really migrated out of the bedroom and onto the living room TV, something that Hollywood and other interested parties really wanted to avoid.